Church after church faces eventual death while helplessly lamenting its fate. What perversity is at work that causes those who sincerely love the church to become obstacles to growth? Like the apostle Paul, churches don't always do the things they want, but instead they do the very thing they hate. Why? 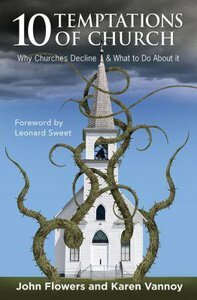 While the theological answer is sin at work in us, the organizational answer may just be that members of dying churches unconsciously find a payoff in the church's decline. They are tempted by church. About "10 Temptations of Church"